Suppose I told you that there is a form of furniture that, according to some scholars, has been in continuous use for 5,000 years. Suppose I also told that an estimated 1.5 billion people currently use said furniture form. OK, where to begin? I came to this project by way of two completely different encounters. Neither of which I had given much thought to at first encounter, but apparently each took hold in my subconscious. Eventually working their way back to the surface and leading to here. The first came almost two years ago. Back in February of 2015, Lost Art Press posted and article pulled from the May 1925 edition of The Woodworker. The article, “Simple Type of Indian Home Cot“, gave plans and construction details for Indian style cot. The joinery employed is what caught my attention at the time, not the piece of furniture. So I made a mental note and moved on. The second encounter was brought on by pain. Back pain to be specific. Thanks to an accident during my teens and lot of physical labor ing my youth, I have a sketchy back. Most times all is good, but once in a while my back decides to remind me of the sins of my past. I’ve tried just about every remedy out there except pills and surgery. Typically, a few nights on the couch does the trick though. During an episode a few months ago I did an internet search to see if there was any new schemes to try. I stumbled upon an article (which I can’t seem to find now) that suggested sleeping on an Indian charpoy. After looking up what the heck a charpoy was, it jives with my couch routine. The charpoy was interesting though and I made another mental note and went about my business. Apparently the seed was planted. I found myself searching for information on the charpoy. The first thing I found was that there isn’t much info to be had. There are plenty of photos to be had and a smattering of videos though. Most of those videos are of people weaving the infill. What I have turned up so far has created a borderline obsession with this piece of furniture. Which brings me back to the statistics at the start of this post. It is speculated that the charpoy has been in continuous use for an estimated 5,000 years. 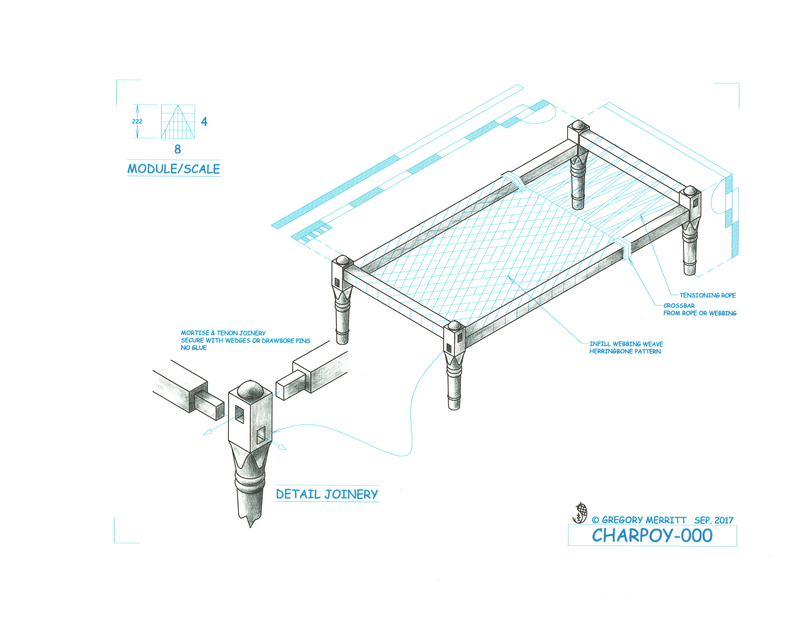 It is also estimated that 1.5 billion people are currently using the charpoy on a daily basis. Those are impressive statistics for anything, but especially so for a furniture form. So what is a charpoy. The charpoy (trans. 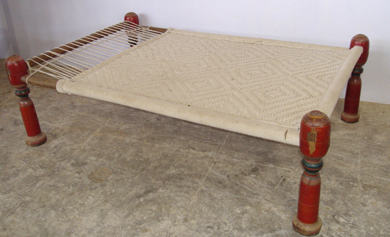 four footed), charpaya, charpai or manji is a bed frame originating in the Indian subcontinent. Traditionally made of wood or bamboo (modern variants use metal) consisting of four legs and four rails typically joined with mortise and tenon joinery. The platform (infill) is created be weaving rope or webbing in a wide variety of patterns. Ranging from the simple and crude to the highly refined and decorated and serves as bed, couch, table, drying rack and for whatever other need arrises. A video about a craftsman who makes charpoy for a living. Here is a video of weaving the infill. And a video of weaving with webbing. Unfortunately I have yet to find any real information as to how these are traditionally constructed. I had hoped to find something about how the length, width and height are typically determined, but no luck. So I was forced to guesstimate based on looking at hundreds of photos. I think I’m pretty close though. I came up almost equally as empty as to what kind of wood is typically used. Although I did find mention of teak and mango wood. As well as the use of bamboo. I’m sure the material changes with the region in which they are built. I’ll be building my example from Douglas fir. 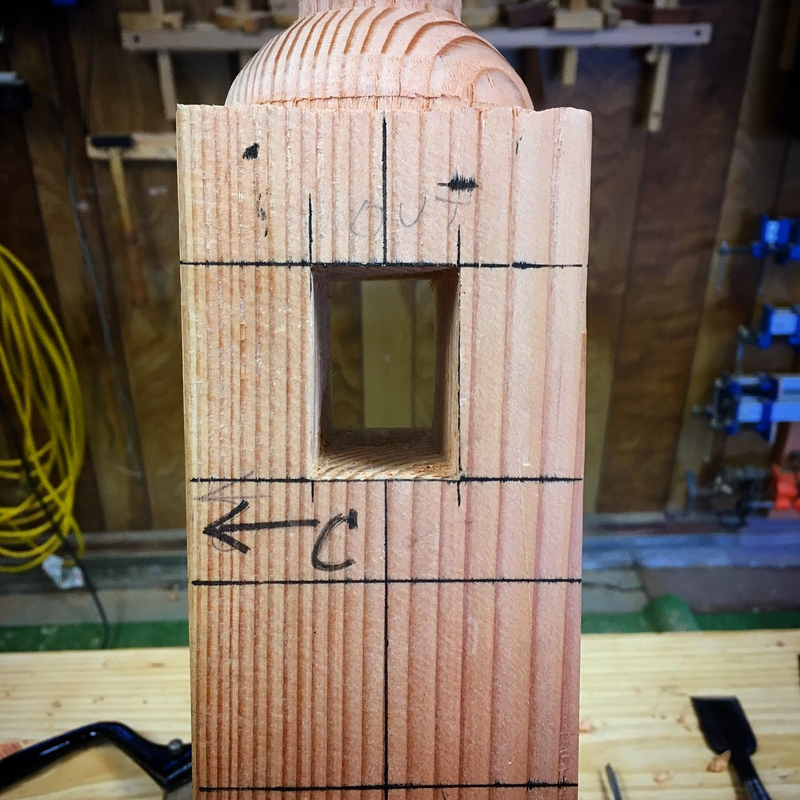 I can get 4″x4″x96″ Douglas fir posts from my local home center and it is plenty strong and stiff for this particular application. 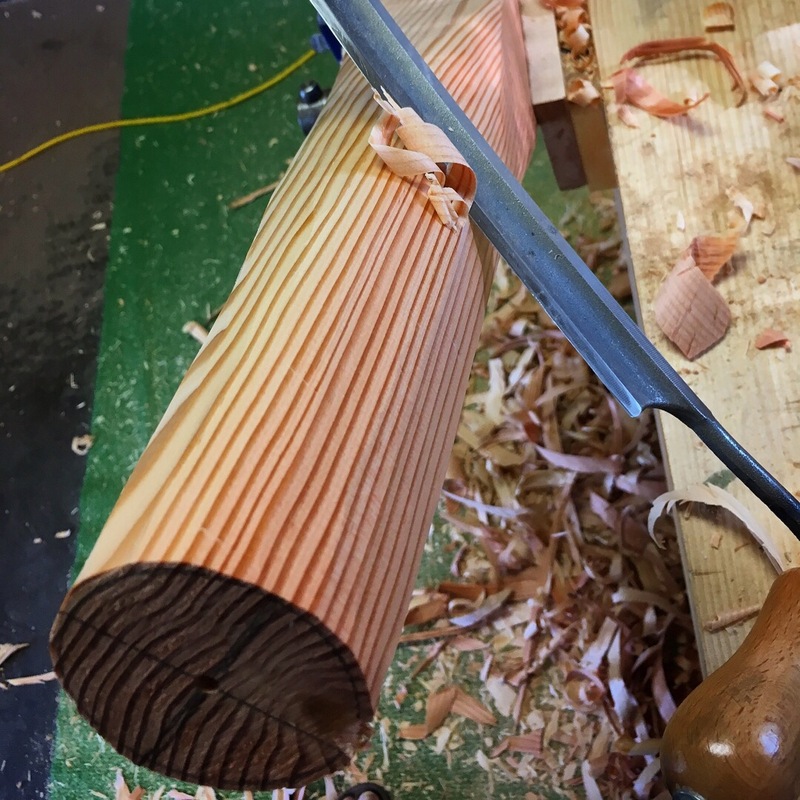 To start, I cut four lengths of fir to serve as the legs. Almost all of the photos that I have viewed show charpoys with turned legs. Some are simple tapers others are elaborate examples of turnings. My legs will be simple. Just a bit of taper and a few beads. 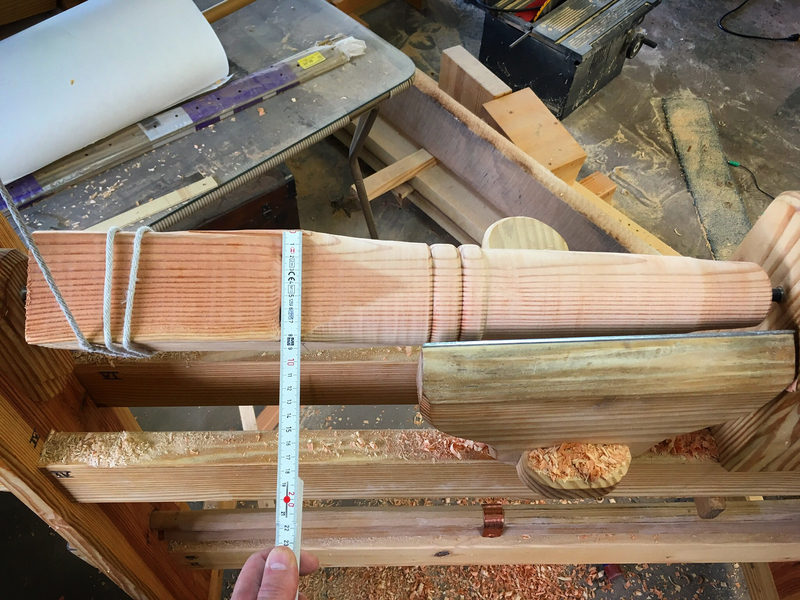 I quickly found that turning something this big on the spring pole lathe is a bit of a challenge. Your fighting the momentum with every pump of the treadle trying to stop and then reverse the direction of blank. Using fir added to the difficulty. Fir is stringy and soft. It also is abrasive to tools edges. This means that the turning tools needed to very sharp and then sharpened often while turning each leg. To lesson the turning work, I used a hatchet to remove the bulk of the waste and then cleaned up the ugly with a drawknife. 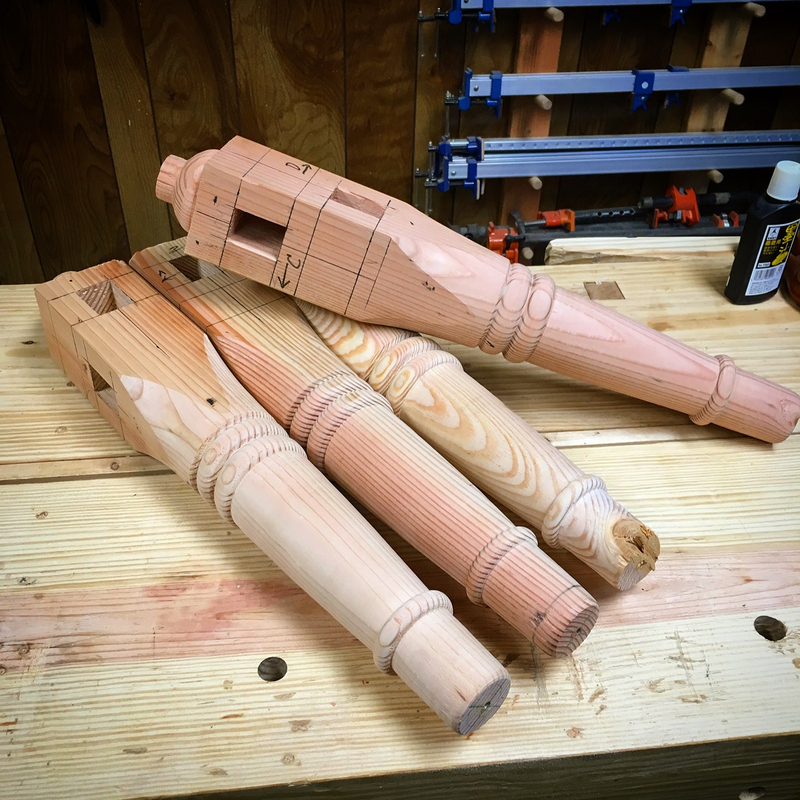 This lessened the amount of lathe work, but it was still a heck of a lot of work to turn these legs! The legs are mostly done. 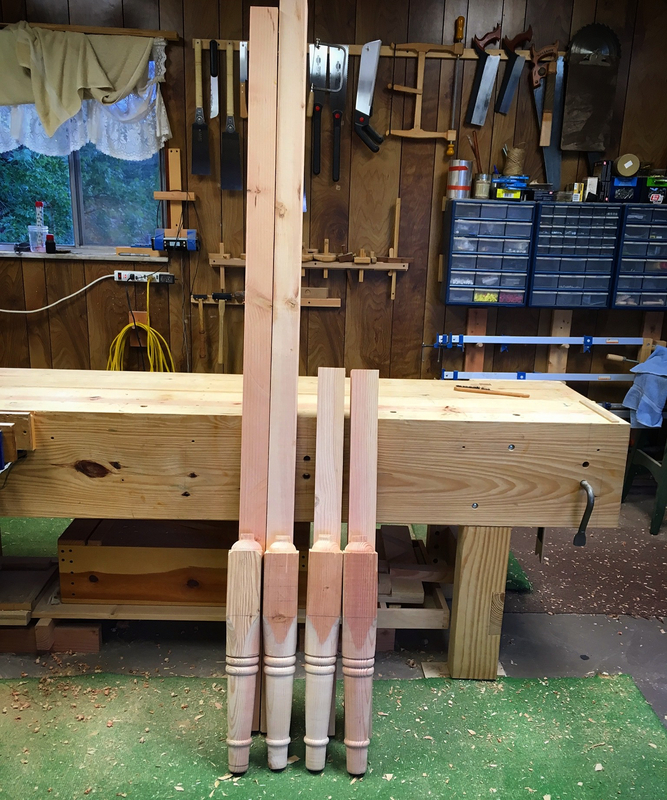 I’ll wait to finish them off until all of the joinery is completed. 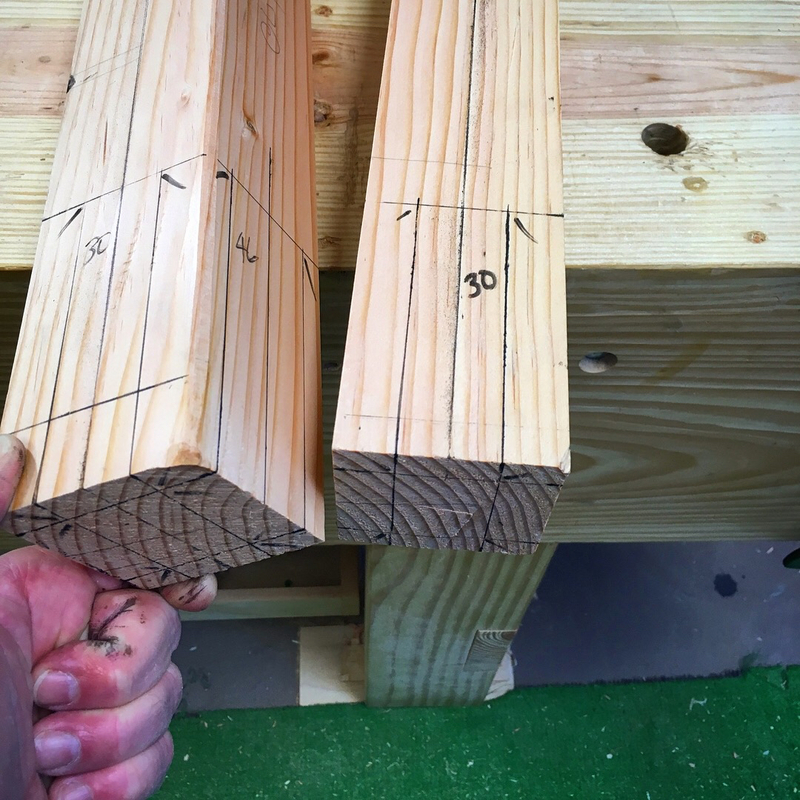 The next task was to mill some fir to the required dimensions for the four, two long and two short, rails. This I did on my old job site table saw. 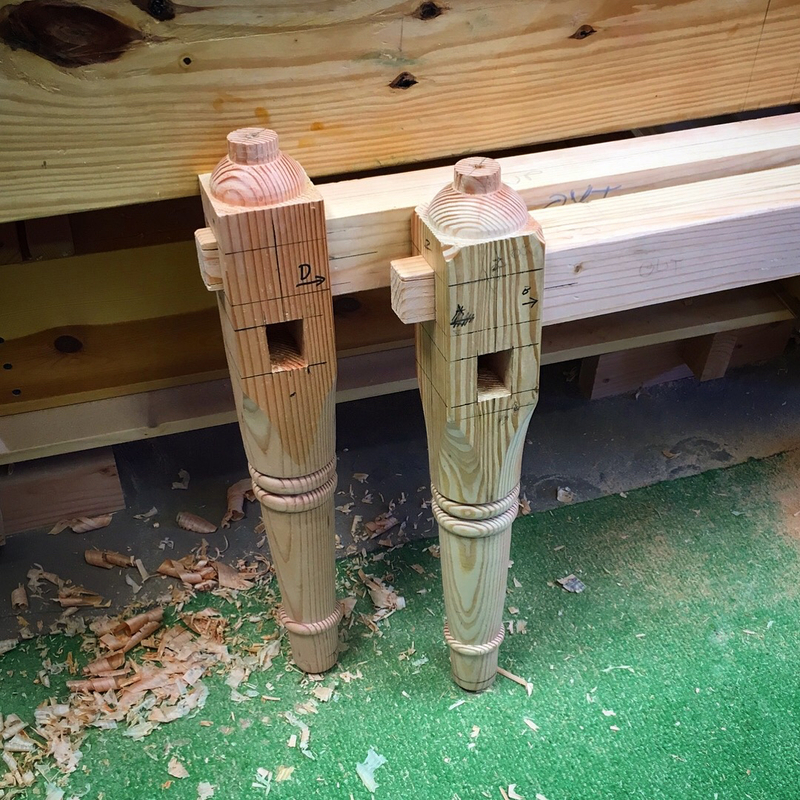 The rails are joined the legs with thru mortise and tenon joinery. 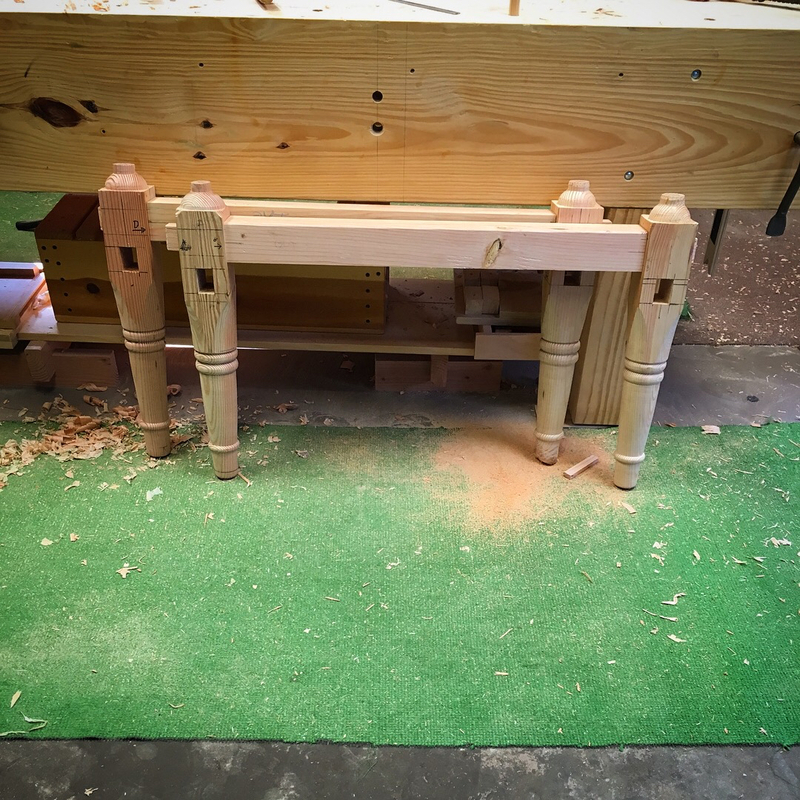 I began the joinery process with the mortises. 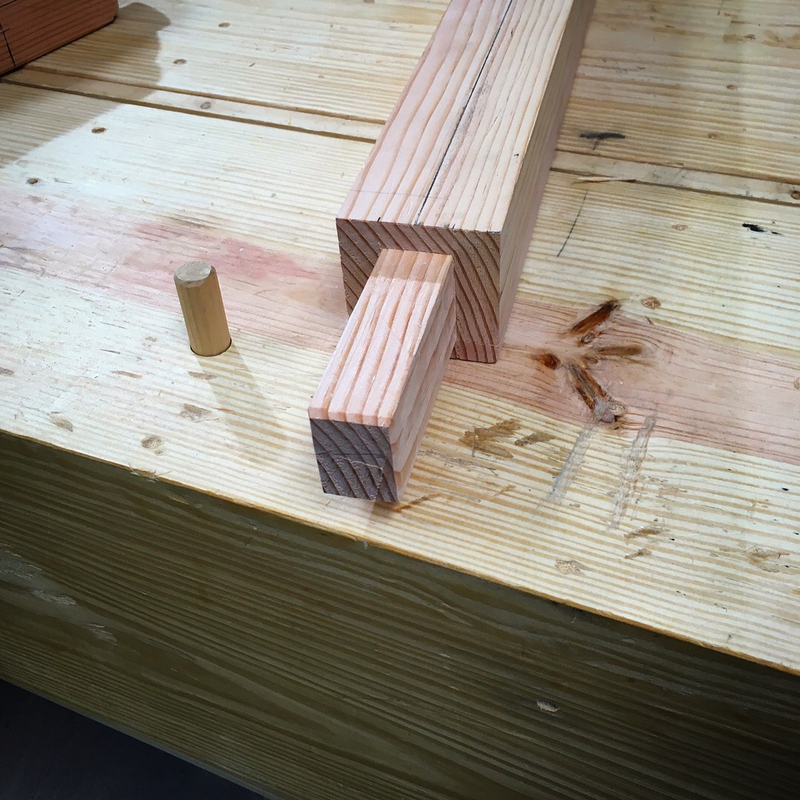 I like using ink and a sumisashi for laying out this type of joinery. I also like laying out around a centerline instead of using a gauge. 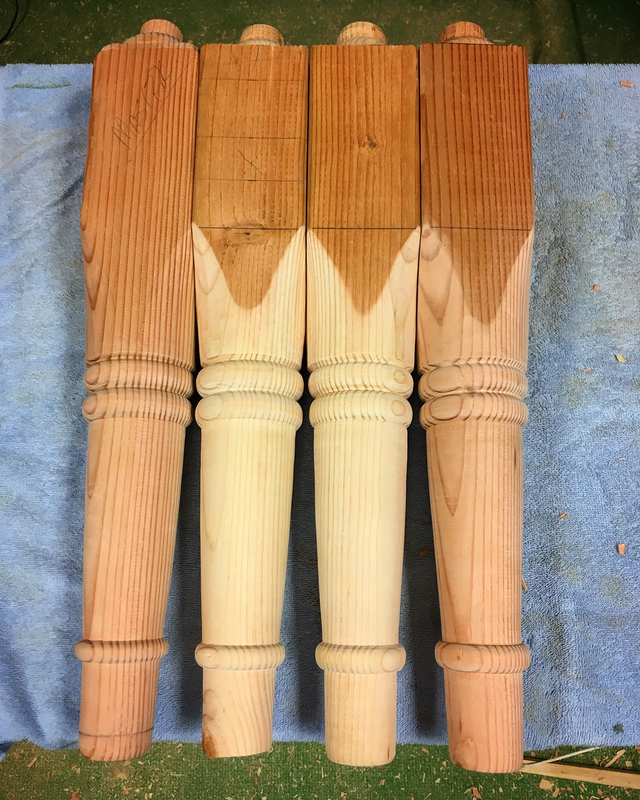 It has been a while since I laid anything out like this and I had a couple of miss steps, but managed to get all eight mortises layer out and ready for chopping. 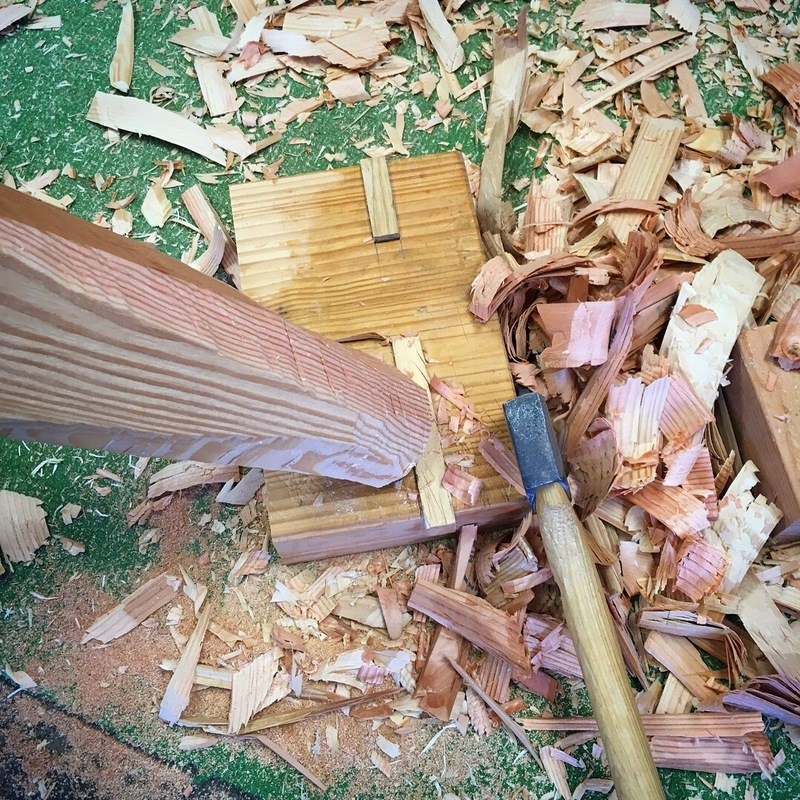 I began chopping the mortises by first chopping a shallow mortise on each side. Then I bored out some of the waste with a bare and bit. Then chopped out the remaining waste. Again, the fir is tough stuff and hard on edge tools. So lots of sharpening took place while chopping these mortises. I then turned my attention to the rails. First squaring them up. I’ll be shaping these and adding a uzukuri surface after the joinery is complete. So I wasn’t too concerned with any minor tear out. 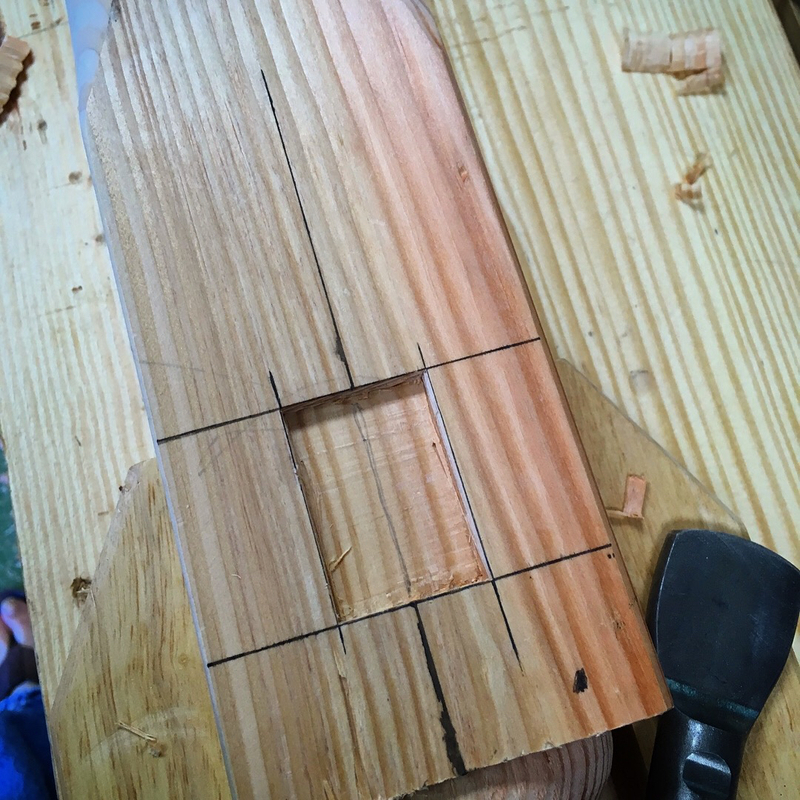 I again used ink and layer out around a centerline to establish the layout for the tenons. 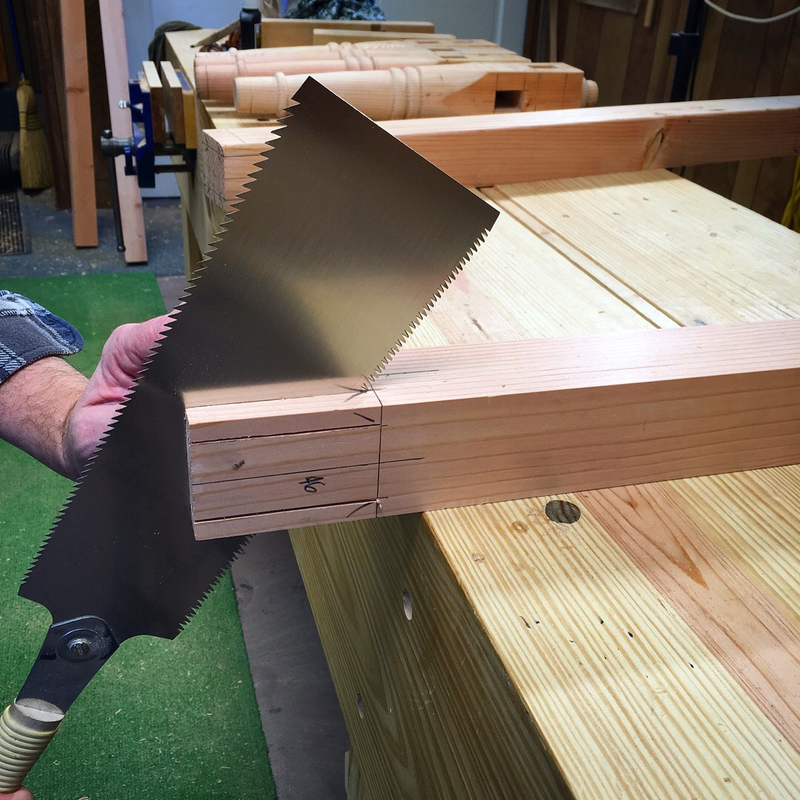 To cut the tenons, I first made all of the rip cuts with my largest ryoba saw. 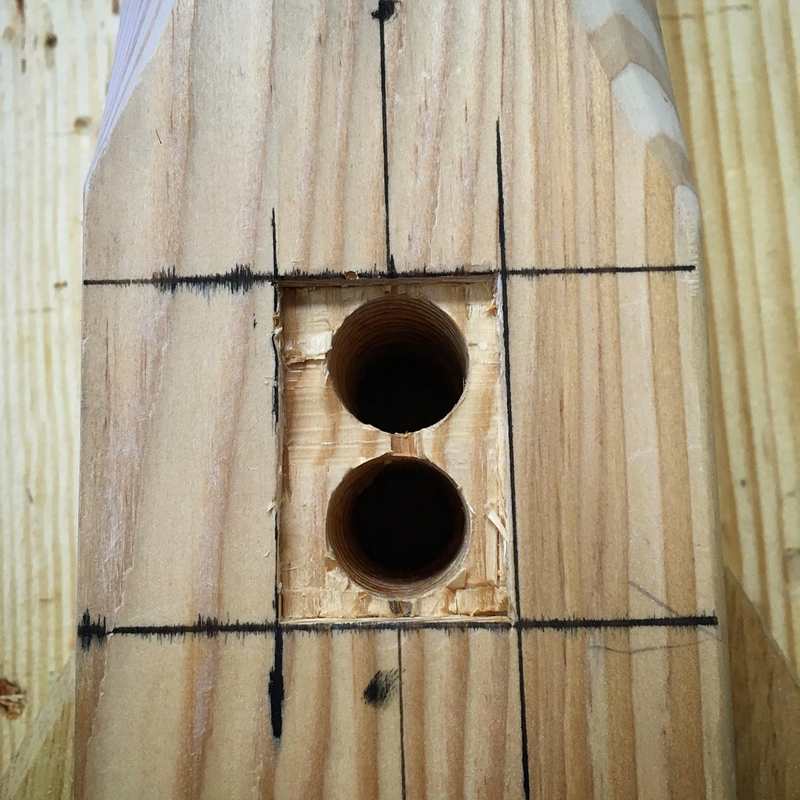 Four crosscuts later and the tenon is revealed. After a little minor fitting, I had the short rails tenoned into the legs. I’ll start on long rails next. I apologize for such a long opening post for this project. I have struggled with this post. Mostly because I didn’t think most of you would know what a charpoy was. I have also struggle with the lack of information on charpoys. At any rate, the project is started and we shall see what I end up with. If you have any information on the charpoy please share what you know in the comments below or send me an email with the link at the top right of this page. I really have become obsessed with this piece of furniture and would love to put together as much information as I can on its construction, history and use. This entry was posted in Charpoy, Design and tagged charpai, Charpoy, douglas fir, mortise and tenon, sumisashi. Bookmark the permalink. You’re really making good use of that lathe. So you suffer with back pain as well. My neck and lower back are shot and it’s not stagnant but getting worse. I’ve developed a shake in my left hand due to me neck and the lower back well it’s just painful. The exercise I get from hand tools doesn’t help it in anyway. I thought it would at least strengthen the muscles and support my lower spine but all that’s crock invented by the physio’s. They talk about stretching and that helps for about 5mins. Does this charpai help in anyway? In theory it does, but I wont be able to confirm anything until I get the thing built. I had a freak accident when I was 14 that compressed two vertebrae and left me paralyzed from the waist down for several hours. My back has been sketchy ever since. I saw a man lacing a charpoy in a market in Rawalpindi. He was lacing the frame with brightly coloured polypropelene twine about 3/16″, maybe 1/4″dia. The lacing pattern was a simple rectangular grid pattern. The details escape me – after more than 20 years – but I remember that yellow twine. I bet it would be cool with 550 cord, although probably not too traditional. It would look cool, but 550 stretches way too much. Leaning towards just webbing for this one…at least at the moment. LOL..it always pays to have a backup plan. I do have a tendency of getting myself in trouble. It seems lots of people have back pain, me too. Not quite good for hand tool woodworking. Many years ago, a friend helped me by giving me a sequence of stretches and exercises printed by a famous Hospital specialized on orthopedics. These 13 simple exercises are really very effective, kind of miraculous, if you practice 2 – 3 times a week for 20 minutes. I do it in my bedroom and on the bed also. If interested, please let me know so I may email a .pdf file to you. Ricardo Corradini says: If interested, please let me know so I may email a .pdf file to you. Google translate shall also help you.